After months of planning, my girlfriends and I escaped to New York City for the weekend recently. Between flying to and from La Guardia (or La Garbage as my Uber driver called it), I figure I spent merely 40 hours in the Big Apple. Thankfully, 40 hours was all I needed to have a blast! Here’s what I saw and did, in case you need inspiration for your next weekend in NYC. My friends and I are firmly Generation X. None of us travel for business, so this was the first time any of us used Uber. It worked great! Just a tip: if you want the Uber driver to pick you up at your location, make sure you type in the correct address. That’s really helpful. 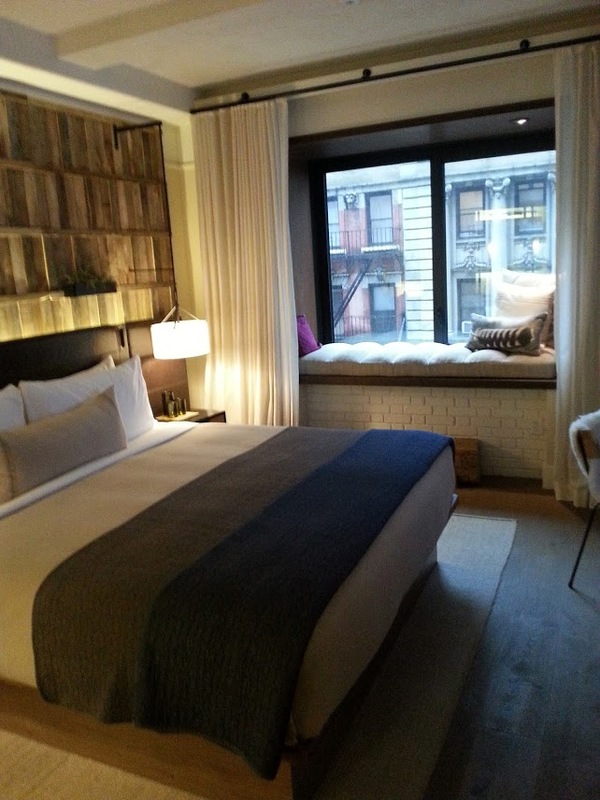 We stayed at a fabulous hotel, One Hotel Central Park. There were a lot of plants growing off the wall and no one who worked there was older than 30. That last fact made me suspicious and also vaguely tired. Anyhoo, when one of our two rooms wasn’t ready at check-in, the hotel made sure we were happy by sending up not one, but two bottles of wine. Good call, One Hotel Central Park. We were happy. We saw Hamilton. And, yes, it was amazing and lived up to all the hype! I even cried at the end and I didn’t see that coming. I recommend, if you can get tickets. Today's the big day! Going to see #Hamilton! Plus, now I can say lots of cool Hamilton catch phrases: Talk less, smile more; Rise Up; I am not giving away my shot. We dined on coal-oven fired pizza, organic locally sourced chef-inspired creations, lobster rolls, and more. If you want it, NYC has it. Check out the frozen hot chocolate from Serendipity. It was delicious and huge. I got warm feelings thinking about the John Cusack-Kate Beckinsale movie, too. 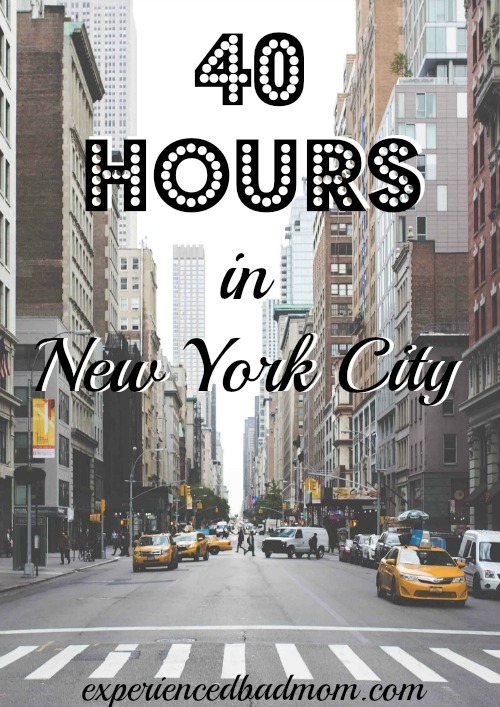 You CAN have fun in 40 hours in New York City. Try not to dwell on the fact that planes get delayed and airport construction is horrendous. Or that it takes 6 months to plan a 40 hour trip between old friends. Have you been anywhere fun lately? I’d love to hear! Not one but two bottles of wine? Wow. That’s service. What a wonderful omen for the start of your trip, Katy. And Amra was a gem, also. Love to see Hamilton and NYC. Haven’t been to the latter since I was 8. Attempted to get there 3 years ago but snow storm cancelled my flight. Settled for Toronto. Not quite the same! Psst Am on a fun adventure with my mom now and will reveal all soon! Oh, boy! Can’t wait to hear what you and Frankel, Frank, er, Francine are up to!! I think you’d love a NYC visit — if you can get there. It might take you 4 years to plan that girls weekend! We started in January, I believe, and got really busy in April finding a weekend this fall that worked. Sigh. The life of moms! 1. Go ahead and ask for a Diet Coke, even if it isn’t on the menu. You never know what will happen. 2. Take Katy with you on every trip to NYC so she can negotiate carriage ride deals. 2A. Don’t believe the guy who tells you that the horses “aren’t strong enough” to go as far into the park as you want to go. 3. Figure out how to use the Uber app before you go so you don’t find yourself learning it at 9:00 at night on the corner of 54th and Broadway. 4. At Serendipity, put your name in and walk to Dylan’s Candy Bar to kill the hour-long wait. Where is John Cusack indeed? I loved that movie and will definitely have to check out the frozen hot chocolate at Serendipity on my next trip to the Big Apple. I’m a little jealous that you got to see Hamilton but happy you had such a great, action-packed trip! I am SO jealous that you got to see Hamilton. I really want to see it! I hope to get back to NYC some day. Also, I’ll be using Uber for the first time in March when we take one from Disney to Universal and back. I’m nervous. Amber, we were so nervous to use Uber, too. Thankfully my friends and I supported each other! It turned out fine and I think in a town like Orlando it’ll be great. But I remember when they sent the first car–they send the name and picture of the driver and his GPS location to your phone–I was jokingly thinking, “here come’s the mass murderer!”, LOL. Woo-hoo! I am glad to see you had a blast! I have a life’s goal of hitting Serendipity some day. Oh, and NY in general. Obviously food is my priority…. Well, if food is your priority, then I’ll have to tell you about The Plaza Food Court we visited sometime, too. mmm….lobster rolls. That sounds like an AWESOME trip. So jealous that you got to see Hamilton. We’re kind of nerdy about early American history around here, so I can’t wait to get to see it sometime. And two free bottles of wine sounds like the key to my heart….or my wallet. Either way, I’d be happy, too. Thanks so much for joining the #happynowlinkup!